PHONE ENQUIRIES WELCOME – call or text Michael on 0418 186 686 – Best to call us on the day of the event (not email) if you have any enquiries. 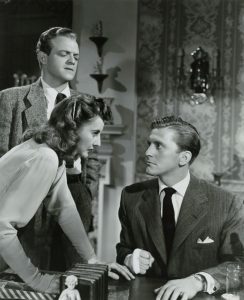 Stars, Barbara Stanwyck, Kirk Douglas, Van Heflin, Lizbeth Scott, Judith Anderson. Directed by Lewis Milestone. 116 mins. A man returns to the town he left as a boy and is reunited with his childhood friend and her husband however secrets abound regarding the murder of his friends Aunt the night he left town many years before. 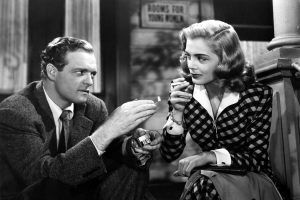 A powerhouse cast (screen debut of Douglas) at their very best is assembled for this well scripted and absorbing noir/melodrama. 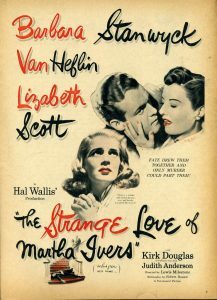 Easily holding the viewers attention, it’s skilfully built up tension, in which characters that are explored to such a degree that one can understand the darkness and actions of Stanwyck’s character, full of fire, which grows through the film coupled with Miklos Rozsa’s perfect score and we have high melodrama in every sense of the word! Our thanks to the National Film and Sound Archive, Canberra for provision of content for this screening.